I have ALWAYS loved Valentine’s Day. Seriously, like from birth. Not sure if it has more to do with my obsession over the color pink or the fact that a single Reese’s heart can literally make my day (is that sad? ), but I can’t get enough of the holiday. I loved going with my mom to CVS and picking out my Valentine’s Day cards, reading through all of the sentiments on each, and deciding which friend/classmate would get each one. The thrills of elementary school, amirite? I also couldn’t wait for Vday, because it meant I’d get a cozy new pair of festive socks (covered in hearts, flowers, anything pink, red and white, really) and a bag or two of my favorite candy. These traditions were everrrrything to me growing up, and I cannot wait to annoy the s*** out of my kids with my own holiday hacks when they’re older. They will learn to love the annual trip to Paper Source every February to pick out the cutest cards for their besties. If it means they’ll be rewarded with candy for enduring my crazy, then who cares, right?!!? So, anyway, on the subject of candy, I’ve had many favorites over the years. Pink and red M&M’s and Kisses when I was super young, all-red Skittles, Starbursts and Airheads when I was in middle school, heart-boxed Dove chocolates in college - when me and my now husband sent each other long distance love packages from our 4-hours-apart schools - and now sour gummies of every kind - I developed a crazy crush on sour things to mellow out my morning sickness when I was pregnant last year, and haven’t kicked it since. So, suffice it to say, you cannot pull me out of Sugarfina without some sweet or spicy Sugar or Hot Lips, Bubbly Bears, etc. I spent 25 minutes there a few weekends ago…. ANYONE can be a fan of chocolate on any given day - especially me when it’s my TOTM - but for Valentine’s, if you’re craving cocoa, you’re a total romantic. You might even say that you hate Cupid, especially if you’re single over the holiday, but secretly you love it. You enjoy indulgence, you’re a huge believer in the phrase treat yo-self, and you don’t mind simple comforts. Snuggling up under a blanket, with a huge glass of rich, festive red, Grace and Frankie in the background, and a box of chocolates within reach. Wait, I forgot about these… I’m pretty sure I went through a tart and tangy time in my tween years, and hoarded bags of these for months … but I digress. For anyone who loves this twist on a Vday vintage favorite (Brach’sConversation Hearts, you’re everything we think of when we think of Vday, but you taste awwww-ful #sorrynotsorry), you’re playful, creative, up for anything and pretty much the fun one in your squad. You also probably get everyone into the spirit of things. You’re the one sending out grown up Valentine’s invites to drinks after work or setting up blind dates for your single friends so that they don’t have to handle the holiday alone. You’re complete sass. We grouped them together, because in all likelihood, if you love Skittles, you also love Starburst. They’re easy to eat (especially if you’re pouring them into a mug at work and snacking throughout the day - just me? LAME! ), and they’re just the right amount of festiveness. If you like these two, you’re probably a little shy, reserved, want to participate in the fun of holidays, but don’t want to seem to extra. You enjoy making social commentary, watching people, figuring out how other people think. You’re also someone who takes her time, isn’t impulsive. Likes to chew on things before making big decisions…. If you like these tweaks on Kit Kat White Minis, then you’re probably as basic as they come (HEY - I’m guilty too!!). You want whatever’s hot RN. So, red velvet anything is probably always on your hit list. You’re also a little showy, you’re an attention whore a bit, whoops! You want all eyes on you, at all times. You’ll put out a candy dish at work, filled with these babies, and just sit and wait for the flock to gather round your cubicle. That said, you appreciate the essence of Valentine’s Day, and you want to celebrate. You’re probs also the one who’s gotta have Peeps and Cadbury Eggs for Easter every year, too. Festive AF. Every once and awhile, I get get down with a PP. It’s refreshing and nostalgic a bit. But, by all means, it’s not something I can nosh on every day. I’m not a biggest mint fan. If you hold out for heart-shaped Peppermint Patties for the holiday, then you’re probably a little quirky. Sweet and also a little strange - like Kendall on The Bachelor, she’s weird, yes, but also suchhhh a great departure from the drama and crazy courtesy of Krystal. You’re someone who’s surprising and charming. You’re also coooool as a cucumber, stress isn’t second nature to you, and you can roll with pretty much everything. 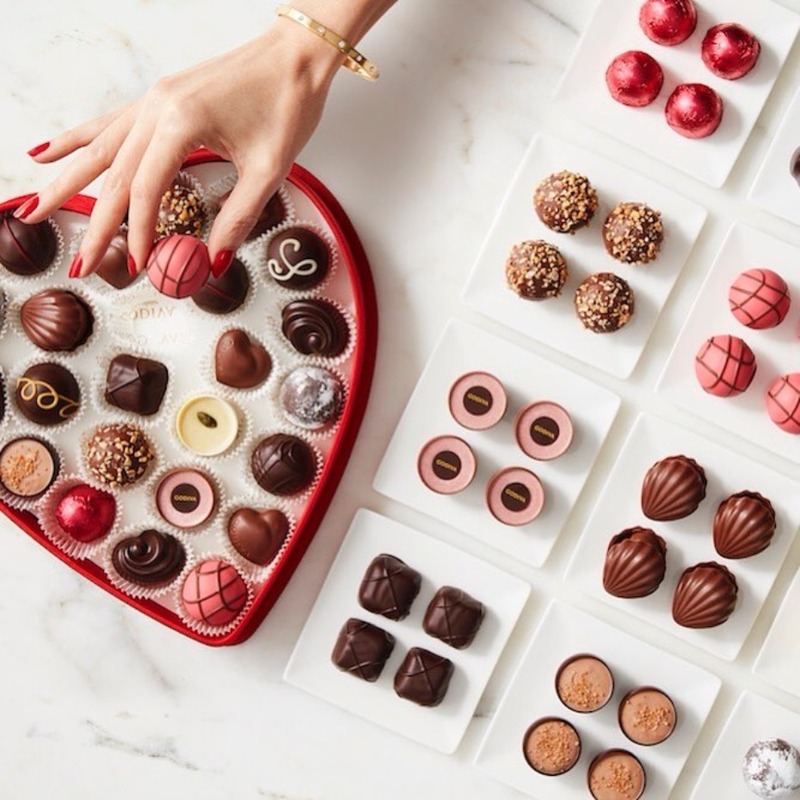 Oh, btw, if you’re a chocolate fan, we read about something amazing happening at Godiva stores this Sunday, February 11th… a tasty truffle is yours FO FREEEE. So go get your milk, dark, or white on. We’ll be there, too. Duh. Remember when we compared Halloween candy to your bridal party? It can be done with Vday candy too!